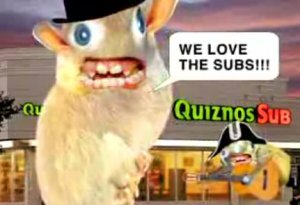 Many years ago, Quiznos ran a series of fantastic commercials featuring a pair of singing rats, or... something. I mean, they're rats, but their faces were replaced with something strange, yet strangely compelling. I don't know why. I searched around on youtube and found a few of them. Oh my gosh! I remember those! I'm still convinced Adam Sandler was their musical inspiration. haha... I thought they were great. At the time, they kind of weirded me out, but after the commercials were gone, I kind of missed them. Yay, youtube! Many years ago? It was 2004! Am I that old?